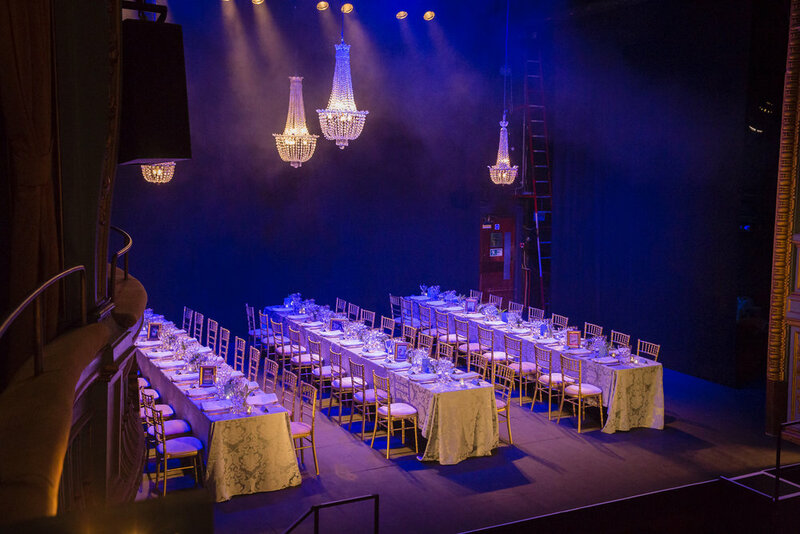 It was an honour to be asked by one of our favourite agencies, Quintessentially, to cater for a private event to be hosted on stage at the Harold Pinter theatre in London. The Harold Pinter Theatre on Panton Street, London opened on 15 October 1881 as the Royal Comedy Theatre. The theatre's reputation grew through the First World War when C B Cochran and André Charlot presented their famous review shows. 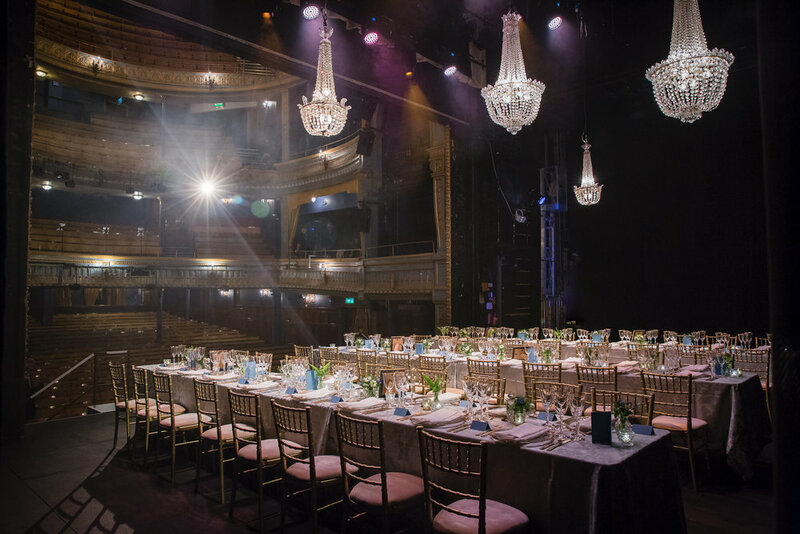 The theatre now hosts a range of far reaching performances, from musical comedies to revival and experimental theatre and includes hugely successful shows such as Savages and The Rocky Horror Show. Our experience was one of a kind. We set up three long tables for 54 special guests. The tables were draped with antique grey damask linen and adorned with gleaming gold rimmed glassware. 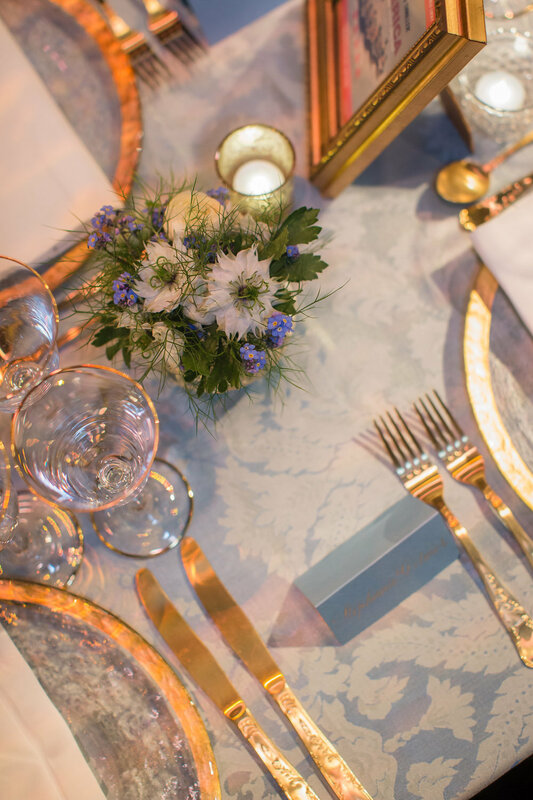 Gold edged, glass charger plates complimented the look, along with traditional antique cutlery. Further decoration included simple displays of wild flowers in cut glass vases and mottled antique gold tealight holders containing flickering candles. Guests feasted on starters of Charred marinated courgettes and tomatoes with walnut Romesco and balsamic pearls. The main was a light dish of Baked Bream with asparagus, Jerusalem artichoke puree, Charlotte potatoes, samphire and sauce vierge finished with capers. Desserts were a modern take on a Chocolate Orange - blood orange and bitter chocolate torte served with yoghurt sorbet, blood orange gel and syrup and topped with roasted hazelnuts. Overhead, chandeliers were hung and the dramatic lighting highlighted the theatre beyond. A truly memorable evening on stage.